Matcha came into my life about a year ago and I’ve been making up for lost time ever since. If you haven’t had a chance to peruse our blog to your hearts content, take a look at my matcha cacao swirl tarts, matcha milkshake, matcha latte and matcha pea soup and you’ll start to see what I mean. For those not in the know, matcha is powdered green tea leaves, which means that in terms of antioxidants it’s way more powerful than just a cup of green tea as you’re consuming the actual leaves, not just steeping them in hot water. It’s certainly an acquired taste, but one that I have very much acquired and really love. These balls are just on another level when it comes to snacking; they’re chocolatey, sweet, chewy and with a hint of that lovely matcha flavour, as well as being packed with antioxidants from the cacao and matcha powders and protein, good fats and fibre from the dates and cashews. In summary, they’re a delicious snack but they’re so so good for you at the same time. Matcha and cacao powders both also contain small amounts of caffeine, but not the kind you get in your double espresso aka a jittery high followed by an almighty slump, the kind that gives you a lovely little buzz and puts you back where you belong on top of the world. So they’re great for a bleary-eyed morning or a mid-afternoon lull! Pop the ingredients in a food processor and whizz for a couple of minutes until they combine to form a big sticky ball. 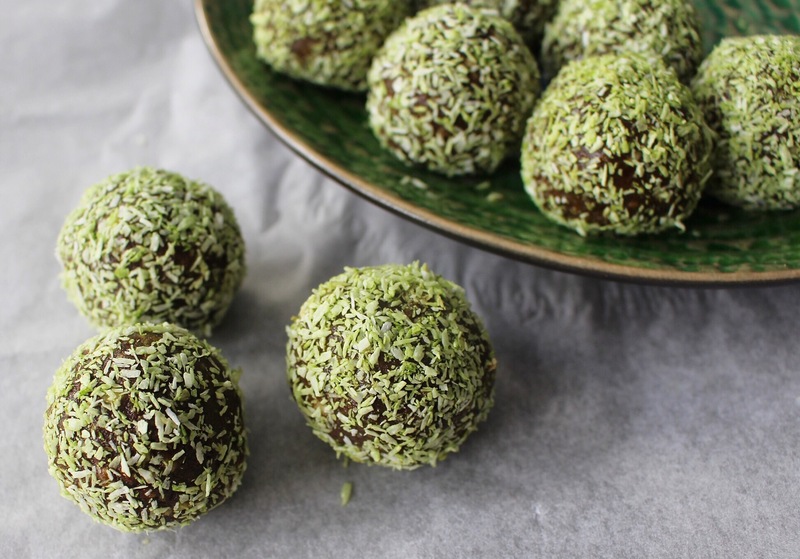 Roll the mixture into about ten small balls and in a little bowl combine an extra pinch of matcha powder with a couple of tablespoons of desiccated coconut. 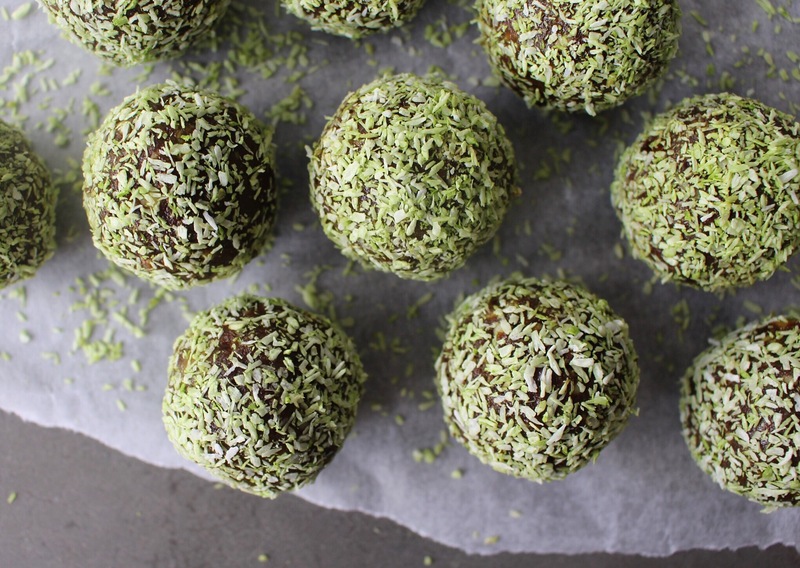 Roll the balls in the matcha coconut mixture and store in the fridge. Can anything be used instead of cashews? my daughter ha a severe allergy to JUST cashews!